Please call us for assistance with conferencing. Why? This is a factor because room size and environment make a difference in the sound quality, even the size and length of the table can make a difference, we will expertly match you up with the right product! 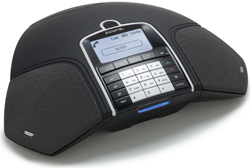 State of the Art with OMNI sound, works on any PBX or VOIP system. The Konftel 300Wx wireless conference phone enables conference calling without the hassle of phone jacks and power outlets. The DECT with GAP/CAT-Iq standard support, allows to deliver crystal clear conversations with less interference and easy integration with existing DECT systems. The phone is expandable with microphones and can be easily connected to your cell phone or computer via USB for VoIP calls over the internet. The Konftel 300Wx features SD call recording and a conference guide that helps you set up multiparty calls. Konftel's patented sound technology, OmniSound® HD audio, provides clear sound and echo cancellation to enhance the quality of phone meetings. A rechargeable lithium ion battery provides a talk time of up to 60 hours. The Konftel 300Wx has many exciting features for users of all types. See the Konftel 300Wx gallery images above for more product views. Affordable video conferencing for the average business under 5k? Yes! OK, so you bought a tv from COSTCO, will this work with it? Absolutely! Call us today 1800-988-6511 press 1, for help with affordable solutions for one site, or multiple sites. Easily transform any current huddle room or use this as a base for a new one, this combination of Camera, PC, and Microphone is as easy as plug it in and go. Simply apply power and an HDMI or even the new Thunderbolt connection to your display and you are ready to visually communicate wirelessly thanks to the advanced wireless protocols supported by the Intel 6235 radio inside of the 4”x4”x1.5” unit. Video Conferencing with Built in core i5 computer! Please fill out the form below, our representatives will get back to you asap! Tell us your Name please! if you have more than 1 email address please provide it if possible. What type of phone system do you have? Data network problem? Need service at your home or place of business?